The new drive trending feature makes troubleshooting faults and alarms simple by allowing users to see how drive monitors interact at the same time. Drive trending is PC-compatible and yields graphical data to aid in viewing drive operational statuses. The DLS4 also retains the functionality of a drive keypad so users can configure drives without switching between the two devices to log or modify parameters. This compact, user-friendly device simply plugs into the keypad pocket of the IMPULSE∙G+ and VG+ Series 4 drives or is connected by cable to Series 3 or G+ Mini drives. All data acquisition is automatic. Data viewing and analysis is available via the LCD scrolling display or by connecting the DLS4 to your PC and viewing with the IMPULSE∙Link 5 Viewer software. 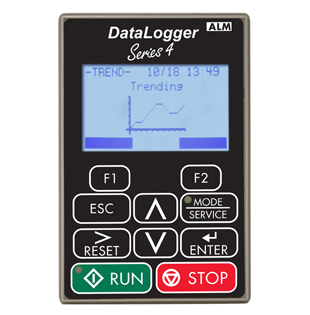 The DataLogger is powered by the IMPULSE drive’s internal power supply when logging or by USB when connected to a PC. Additionally, remote mount kits are available for drive monitoring from outside the control enclosure for arc flash avoidance.